As part of the Flora of the Higher Elevations of San Jacinto Mountain that I am working on, I plan to survey the dominant species at a number of spots throughout my coverage area so that I can create maps showing the distribution of those species in more detail. This survey on the Devils Slide Trail on 10 September 2008 was my first attempt to do such a survey, and hence served as a practice attempt to figure out the best survey method and what data need to be collected. Future surveys may be done differently. In this first attempt, I decided to do relatively-shallow sampling at a larger number of survey locations, in order to try to sample many different environments. Thus on the Devils Slide Trail I did a quick survey of the dominant species at 20 different locations. I noted dead plants as well as live plants since until recently those dead plants were part of the live species cover. This also allows me to estimate recent death rates. This page presents the results. One large caveat to keep in mind in interpreting the results here is that even 20 different locations is not enough to sample all of the different environments found along this trail. Hence interpolation in the plots should be done only with considerable caution, and will often be wrong. 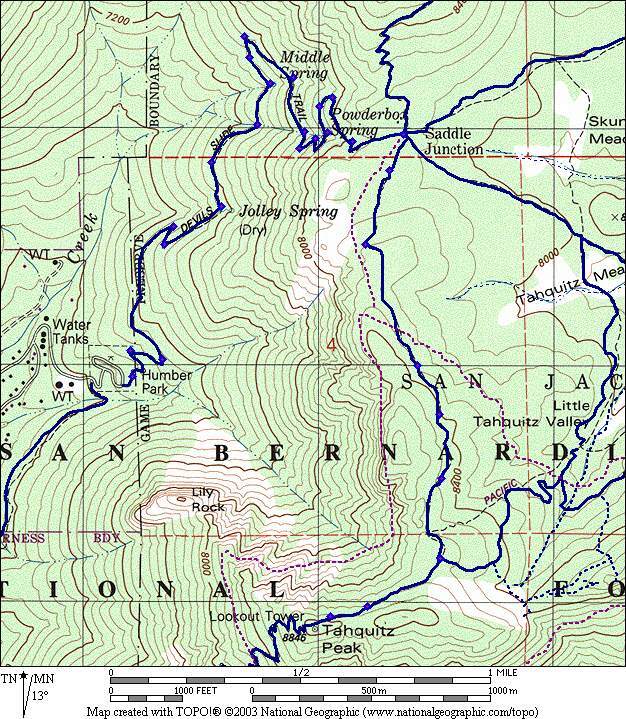 As only one example, the plots below that show only the drainage locations versus elevation cannot be interpolated at all, since there are no other similar drainages found on this trail at different elevations. The survey locations were mostly picked prior to doing the survey. Rather than pick uniformly-spaced locations along the trail, I instead opted for well-defined locations that were fairly evenly spaced along the trail: the switchbacks in the trail and where the trail crossed moist drainages. These locations will be easy to return to if further work is needed in each location. (GPS units work badly on this trail, so locations specified only by GPS points are not easy to return to.) During the survey, I added a few locations where the trail crossed ridges and one location after a long stretch between switchbacks. Only points labeled 3 through 22 are analyzed here. See also plot without locations labeled. For this survey I did not attempt to specify the survey area at each location. I would have liked to have a well-defined survey area so I can get actual species densities. Unfortunately, all methods I thought of involve much more work at each location, which would very significantly slow down the survey itself. Instead, at each location, I simply visually surveyed all the relatively-nearby plant specimens out to a distance where I could be confident of making a reliable species determination for all of the dominant species in a given location. I in general did not go out to the maximum distance I could have surveyed so that identifications were quick and easy. The surveyed distance was not the same at all locations, nor was it the same for all azimuth angles if my sightline was blocked in a given direction by nearby species. This probably creates a small bias toward taller species, since taller species can be seen behind shorter species, but not vice-versa. However, since most of the dominant species are similar-sized trees, this is probably a small effect. Note that I counted plants, and not the area each plant covered. However, since the dominant plants are almost entirely trees that are fairly comparable in size of the area they cover, the survey results roughly correspond to area coverage. An even better conversion to area coverage would be obtained by multiplying the number of shrubs by the ratio of a typical shrub coverage area to a typical tree coverage area. I did not use a rigid criteria in this first survey for the size of tree or shrub accepted for the survey. This mostly affects only the number of white firs, which had many more young trees than did any other species. In retrospect, I probably only counted trees taller roughly than 10 feet (3 m) high or so. The significant majority of all specimens counted were mature specimens. Thus all the results presented here are essentially percentage of total plant cover, and not percentage of total area covered. Live plants posed no problem for determination, but dead tree species occasionally did. Surprisingly to me, the vast majority of the time the species determination of a dead tree was quite clear. I'd never tried to do this before, and I thought it would be more difficult. Often, the dead trees were the spitting images of the live trees, except they were without foliage, with each species have a characteristic form. Most of the dead trees were white firs, Abies concolor, which usually have two distinctive characteristics: they have small branches relative to their trunk size (except for very large specimens); and they have dead branches that curl downward. Also, dead white firs sometimes retain dead mistletoe clumps, which is a "dead giveaway" since mistletoe is essentially found only on white firs at these elevations. The only specimens that could not be 100% reliably identified were very large old dead trees. Old dead white firs, sugar pines, and Jeffrey pines become somewhat similar, especially when most of the smaller branches are no longer present. Of the 135 dead plants found in this survey, only 5 to 10 specimens fell into this category, a number too small to influence any of the plots below. See Dead Trees of the Devils Slide Trail for photographs of some of the dead trees. I realized partway through this survey that I failed to record two very important site parameters: the average slope at each location, and the orientation of that slope. That almost certainly accounts for some of the variation seen in the plots below. Because the area along this trail is very non-uniform, especially with respect to elevation and drainage / non-drainage, there is no specific area which has the species in the same dominance ratio as given in the table above. Instead, the dominant species varies with elevation and drainage / non-drainage, as shown in the plots below. In this section I only plot survey locations that are outside of drainages. The plot above only shows the first three of these four species, so the numbers don't necessary total to unity from just the species shown in the above plot. Note the strong dependence with elevation for two species, which both have a major cross-over point at 7700 feet. Quercus chrysolepis is usually the dominant species below 7700 feet, and essentially drops out above that elevation. Abies concolor becomes the dominant overall species above 7700 feet elevation. It is also the dominant species in Tahquitz Valley just above this trail. Abies concolor is able to have a significant presence below 7700 feet, albeit in smaller numbers. The plot for the other two species is not easily interpreted, since the distribution of those two species is not a simple function of elevation. Ceanothus cordulatus is mostly a higher elevation species, being found in this survey in abundance only above 7800 feet, but its abundance depends heavily on moisture conditions. It can only grow in areas where moisture is too limited for trees, or where trees have been eliminated, or cannot grow, due to other causes. Pinus lambertiana is found at all the elevations in this survey, and it is also abundant at higher elevations as well. The dip in its relative abundance at two nearby survey locations, at 7440 and 7500 feet, is probably related to other factors, such as the steepness of the slope and its orientation. The following plots show the abundance of the next most dominant species, first the pine species (with P. lambertiana repeated from the previous plot) and then the species that are mostly found in drainages. Note the two similar pine species separate on elevation, with P. ponderosa only below ~6800 feet, and P. jeffreyi only above 7000 feet here. These drainage species are almost non-existent in the areas outside drainages plotted above, only being found at lower elevations outside of drainages. The single Calocedrus decurrens at 7440 feet actually was in a small moist area outside of a drainage at the edge of that survey location. In this section I only plot survey locations that are in drainages. Abies concolor and Quercus chrysolepis show the same dependence with elevation, with roughly the same elevation breakpoint, in drainages as outside drainages. Perhaps moisture is not a factor in determining their elevation distribution. However, this survey cannot substantiate such a conclusion since the survey area at each drainage may be dominated by dry locations next to the drainage. The death rate calculated here should be interpreted with caution, since it depends on observing dead specimens that are still present in good enough shape to be identified. No fallen trees were included in the survey; only still-standing dead trees and recognizable dead shrubs. If there is a difference between species in how long recognizable dead species persist, the rates calculated here will not be directly comparable between species. Note that just two species, Pinus lambertiana and Abies concolor, account for 76% of all the dead individuals. Note that the number of individuals is not very large in any bin. The percent of dead Abies concolor seems to be highest at its lower elevations, and the percent of dead Pinus ponderosa seems to be highest at its higher elevations. However, this trend is not statistically significant because the number of individuals of both species, when broken up by elevation, is too small. If further data proves out this trend, it supports the logical presumption that species are most vulnerable at the extremes of their range, as shown, for example, by the results of Kelly and Goulden (2008) in similar deaths in Deep Canyon. The next most affected species are shown in the following plot. The points are not joined by lines, since most of the points in the plot have a large statistical error. Two of these species, Salix scouleriana and Ceanothus cordulatus, follow the same pattern and have their dead individuals concentrated at the lower end of their elevation range. Although again, this difference is not statistically significant within each species, seeing the same pattern in four different species makes it likely that this is a real effect.